Have you ever considered giving your cat bone broth as a treat? Most cat owners haven’t but a lot of dog owners are picking up on its benefits lately. Bone broth is a great mineral and vitamin-packed drink that can act as a nutritional supplement for cats when given regularly. Not only is it cheap to make, it has so many wonderful benefits! Bone broth is made by simmering bones to release all the vitamins and minerals into the water creating a light and nutritiously packed beverage. The bones are then drained out and discarded. Typically, this is eaten as a soup (usually chicken) but some people prefer just the broth as a drink. The science behind chicken soup curing a cold actually has to do with the old-fashioned way of making chicken soup which included simmering the bones within the broth. Not a fan of being in the kitchen? The Honest Kitchen has an instant powder mix for cats and dogs! It comes in chicken, beef, and turkey flavors as well. How Can This Benefit My Cat? Joint Health – Bone broth is abundant with glycosaminoglycans, hyaluronic acid, and chondroitin. These three key nutrients help mend, repair, and keep joints healthy. Older cats will benefit from this because it lowers the risk of bone fractures, arthritis, and sprains. Digestive Health – Gelatin is another nutrient found in bone broth that will repair leaky gut, control bacteria, coat the walls of the digestive tract, and keep things moving. This is good news for cats of all ages as it will keep the digestive tract healthy and happy without the need of having to find specific foods or vitamins for them to supplement their daily diet. Liver Health – Glycine is known for aiding the liver to self-detox and when low in the body, it enables the liver to fully flush itself. Bone broth is loaded with glycine which will help keep your cat’s liver functioning properly to fight off the ill effects of stress, toxins, parasites, antibiotics, vaccines, and so much more. CAUTION Most bone broth recipes include onions, garlic, and sometimes chives. If your bone broth recipe calls for any of those ingredients, do not include them. The best bone broth for your cat will have nothing but liquid. If you plan on making it for you and your cat to enjoy, remove some of the broth before adding any kind of Allium (onion species) and put it aside for your cat. Every cat is different. Some will love bone broth, some will like it, and some will snub it. If you want to get the benefits but your cat is not a fan, you can add a few spoons to their wet food. However, if you feed your cat a dry only diet (which is not healthy) adding the bone broth to the dry food will make it a better meal. 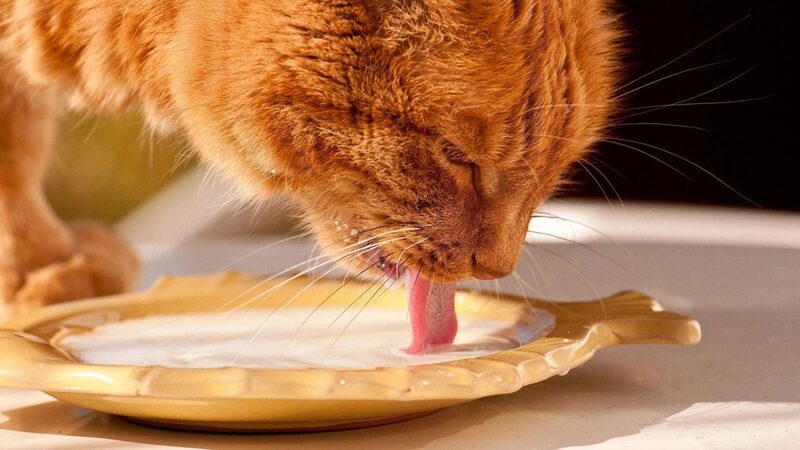 If your cat enjoys it on its own, just let them drink a small amount of it daily or every other day. A good measurement would be 1/4 to 1/2 of a cup. Depending on the ingredients, it can have a lot of salt so the more salt there is, the more it should be limited. The bigger your cat, the more they can enjoy. Do not feed to kittens until they are 6 months old as the gelatin can cause diarrhea. Does your cat enjoy bone broth? Share with us in the comments! We have an elderly cat with kidney disease so we only feed senior food (both wet pouches and dry). I understand he mustn’t have too much protein. Are there any issues with the protein in bone broth we need to be aware of? Thanks for your comment Lizzie. The issue with kidney disease is that not every case is the same. Some cats do fine on low protein diets while most others waste away. Cats require high levels of protein to keep their bone and muscle mass healthy as well as their other vital organs functioning. Protein typically is not the issue here in and of itself but the quality of the protein and the ratio of protein to carb content in the food. Phosphorus is one of the biggest things you want to lower for a cat with kidney disease. Unfortunately, bone broth is high in phosphorus. A cat with kidney disease will not be able to filter out the phosphorus and this is the main reason kidney disease gets progressively worse in cats over time. Hi! Do you simmer the whole chicken? Or just bones? Typically you use just bones. I can agree with what Lisa said. I have a 6 year old that has kidney disease, we thought we were going to lose her last year. She has turned completely around. The vet couldn’t even believe she was the same cat. She went from 7lbs and refusing to eat to 12+ and happy, healthy, and very food motivated. Thanks for the tip, Meranda. I tried Buster’s Brew bone broth tea and my pets love it. I still like to make my own batch of bone broth for them here and there, but it’s a lot of work and I don’t always have the time. There are some great products out there. I order a bone broth tea made for pets from Buster’s Brew. A few other companies do something similar, but I’ve been sticking to what I got originally because they like it a lot. bone broth, also regular broth, helps my kitty stay interested in eating her wet food and boiled meats. she also eats dry food. adding broth to her foods stabilized her eating habits and she gained weight right away. i have a skinny cat who isn’t a big eater, so i was desperate. broth added to her foods turned out to be a godsend. If a cat has a history of crystals, are the extra minerals like magnesium in bone broth a problem? Thanks for your comment Amber. It will not be an issue at all. The key to preventing crystals is to increase liquid consumption. Most cats who develop crystals are on dry only diets. Because the broth is a liquid, it will help. You should only give your cat filtered or spring water. We installed a reverse osmosis system for our pets. Thanks for your comment Eydie Adams. We should all be drinking spring or filtered water at this point, tap isn’t so healthy. Reverse Osmosis water removes natural fluoride and minerals which can cause teeth and bone issues in both humans and pets so it isn’t recommended to be the only water source. Spring (true spring) water is ideal.